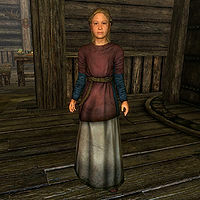 Runa Fair-Shield is a Nord child, and the only female child in the Honorhall Orphanage in Riften. She claims that she is "strong and quick" and willing to do any chore, and will beg you to adopt her whether it is possible for you to do so or not. Like the other children, she is elated at the assassination of Grelod the Kind, and if Hearthfire is installed, she can be adopted afterwards. She wakes up at 6am and stays inside the orphanage. At 10am, she goes outside to the yard to play with her friends. After one hour, she returns inside and later has a one-hour meal at 3pm, going to bed at 10pm. She wears child's clothes and a pair of shoes. She carries a selection of food and toys, and a small amount of gold. Upon seeing you, she will plead you to adopt her: "I'm strong, and quick, and can do any chore you want. Come on, adopt me. Please?" If Grelod is still alive, Runa will also lament on her cruel treatment of the children: "I'm really afraid of Grelod. When Aventus escaped, she was so mad. I got double the beatings that day." or "I hate it here. Grelod the Kind is the meanest person in all of Skyrim." Before you meet with Aventus Aretino, she can be asked who he is, and she will gladly tell you: "A little boy who lived here. Aventus Aretino. He was nice, but really quiet, and sad, because his mother just died." If Grelod is alive, she will continue, "He ran away. Back home to Windhelm. Samuel told me he's trying to get some murderer people to come here and kill Grelod. I really hope he does." Otherwise she will say, "He ran away. Back home to Windhelm. Samuel told me he was trying to get some murderer people to come here and kill Grelod. Did he really do it?" If you are on your way to kill Grelod on behalf of Aventus, you can also ask Runa about her. She will answer, "I hate her. Everyone hates her. She's the meanest person I ever met. Sometimes she even locks us in the... room. Constance tries to stop her, and is real good to us, but it's never enough." When she is speaking to Constance, Grelod will claim that Runa stole from her: "Seven septims are missing from my purse. I know it was Runa. You get those coins back, or by Stendarr, I'll see her rot in the dungeon." Constance will promise to take care of it. Once Grelod is killed, she will cheer along with her friends, saying, "Yeah! Get her! Kill her! ", "Aventus really did it! He got the Dark Brotherhood to kill old Grelod! Ha ha ha ha ha! ", or "Grelod is dead! Aventus did it! Ha ha ha ha ha!" After the assassination, she hints at a possible dark future when she will say, "Kill one person, and you can solve so many problems. I wonder at the possibilities." Now that Grelod is no more, Runa will comment on the change: "Things are much better now that Grelod is dead, but still. I'm sick of this place." Esta página foi modificada pela última vez à(s) 11h57min de 5 de julho de 2014.